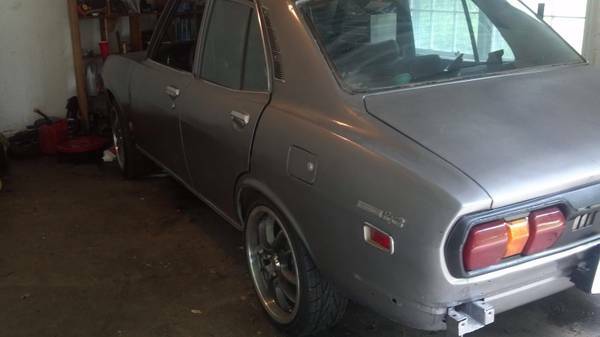 Any European or Japanese car enthusiast should be able to easily appreciate the virtues of the Mazda RX-2. Sharing styling cues with the Fiat 124 coupe and Dino coupe, or with the Opel Manta if that’s your preference, it had the power and smoothness of Mazda’s licensed-from-NSU rotary engine. Further developed at this point, the 12A rotary was starting to show increasing levels of reliability to go with its power, but ultimately didn’t survive in family sedans thanks to the oil crisis, which shone a bright light on its drinking problem. 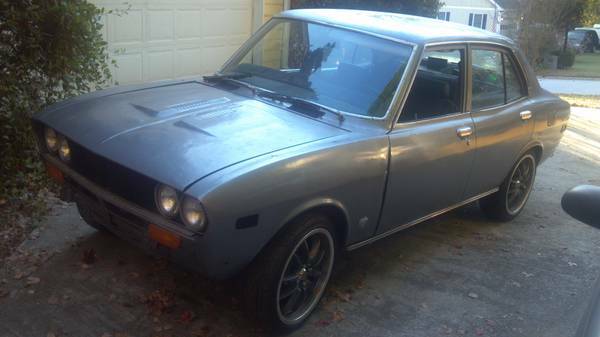 You can find this 1974 Mazda RX-2 sedan for sale for $2750 in Snellville, GA (northeast of Atlanta). This is the best angle from which to see the European influence. Power bulges on the hood are an interesting styling choice, and completely useless, since the rotary engine has such a low profile. The car itself wears grey paint, which looks rather modern for the style, and is quite possibly not original. Bright primary colors work better here, like yellow or green, or maybe even an ochre or plum. Bumpers have gone AWOL, which for a 1974 car is actually a good thing, but you’re left to figure out what to do with the bumper brackets – can earlier chrome bumpers be fitted to this car? 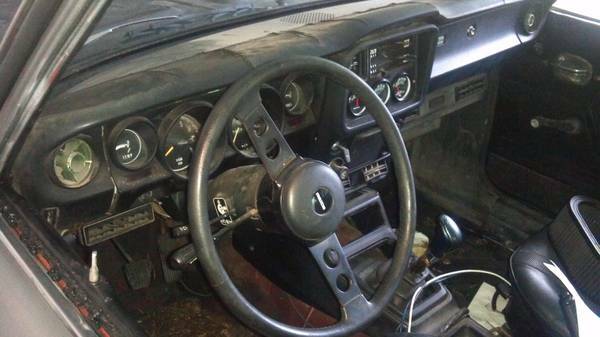 The interior is a little rough, but looks way more sporting than any Japanese sedan of the period dared to be. It’s nice to see a manual shifter, as many survivors were lumbered with an automatic transmission. Cracks in the dash suggest sun damage is likely to be found elsewhere too, so if you care about that, make sure you are friendly with your local rubber and interior parts supplier. It does feature original seats, which is nice, since these are often “upgraded” to cheap Autozone racing seats. Seller says the restoration is almost complete, just like a mohawk is a full head of hair. 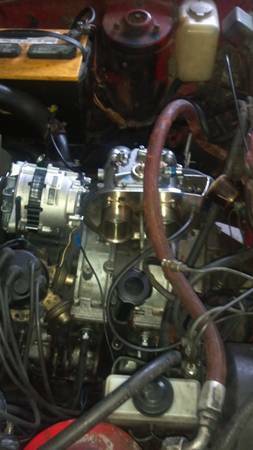 The engine features a rebuilt Streetport 12a engine, a new 50mm Weber carburetor, racing beat headers, and a NOPI free flow muffler. For a more period look, sell the 17″ rims and brand new tires for anything, even some Panasports if you have to. Power goes through a 5 speed, and the car also has a new alternator, starter, and water pump. Just one more shot to show the very 70s-Japanese looking tail lights. While this car still has some needs, the barrier to entry is low, and if you find you’re in too deep, it shouldn’t be hard to find another rotary-head to take over for you. This entry was posted on April 7, 2014 at 5:03 pm and is filed under Feature. You can follow any responses to this entry through the RSS 2.0 feed. You can leave a response, or trackback from your own site.